An alternate name for the main deity in the tentatively Indo-European pantheon of the Yazidi, Malek Taus, is Shaitan. Rather than Satanic, however, Yazidism is better understood as a remnant of a pre-Islamic Middle Eastern religion, and/or a ghulat Sufi movement founded by Shaykh Adi. The connection with Satan, originally made by Muslim outsiders, attracted the interest of 19th-century European travelers and esoteric writers. In the Bahá'í Faith, 'Satan' is not regarded as an independent evil power as he is in some faiths, but signifies the "base nature" of humans. `Abdu'l-Bahá explains: "This lower nature in man is symbolized as Satan -- the evil ego within us, not an evil personality outside." Avowedly Satanic groups have various opinions about Satan, ranging from the conviction that he exists and ought to be worshipped (theistic Satanism), to Anton Szandor LaVey's symbolic interpretation which emphasizes individual will and pleasure-seeking. Most Satanists do not belong to such groups, and may display only temporary interest (for example, as teenagers). 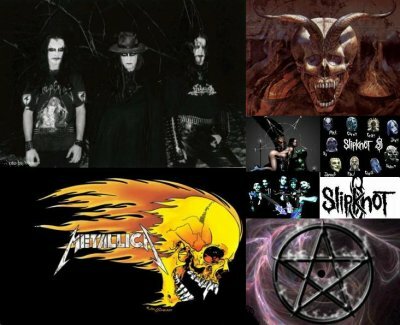 One well-known source of Satanic imagery would be heavy metal rock music, whose performers sometimes profess a serious interest in the religion. Much "Satanic" lore does not originate from actual Satanists, but from Christians. Best-known would be the medieval folklore and theology surrounding demons and witches. A more recent example is the so-called Satanic ritual abuse scare of the 1980s – beginning with the memoir Michelle Remembers – which depicts Satanism as a vast (and unsubstantiated) conspiracy of elites with a predilection for child abuse and human sacrifice. This genre regularly describes Satan as actually appearing in person in order to receive worship. j'adore slipknot cool ^^ ! !